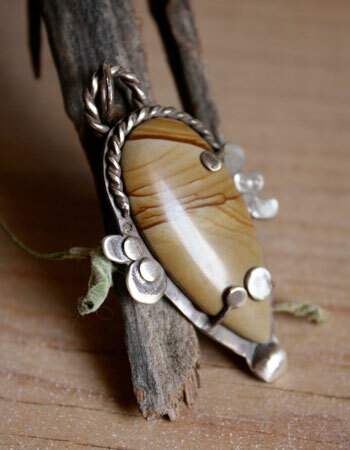 It is a brown jasper showing different color lines due to sedimentary layers or dendritic variations. It also gives the impression of a landscape, of a scene or a picture, giving it its name. 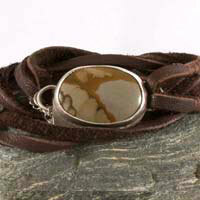 It can be found under the name of picture jasper, landscape jasper, scenic jasper or Kalahari. The picture jasper has been known for a long time. Because of its patterns reminding of landscapes, many tribes linked it to the earth and considered that it would own the ancient secrets of the mother earth. 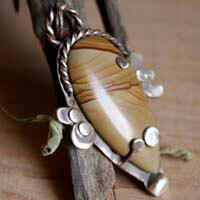 Mines: you can find the picture jasper all around the world but mainly in Brazil, Madagascar, Egypt, Uruguay and the USA. 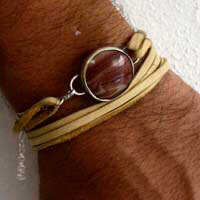 The picture jasper would help the body while recovering from an injury or a disease. It would help stimulating the immune system and would help the body to get rid of toxins. It would help strengthening kidneys, the stomach and the intestines. The picture jasper would relieve from hernias, constipation and would help against obesity. It would relieve allergies linked to chemical products.